Good news! All of the most delicious things on the planet no longer require oil (apparently). Like roasted vegetables, french fries, and cake! Now granola? Cool things are happening, people. Cool things are happening. This easy, naturally sweetened granola requires simple methods and just 9 basic ingredients! It all starts with aquafaba, or chickpea brine, that’s been whipped until light and fluffy. This mocks egg whites, coats the granola, and helps it become crispy without any added oil! Magic. Next comes your dry ingredients. We kept things pretty classic with oats, coconut, chia seeds, and nuts. But it will work with just about any combination of these ingredients – and it’ll likely even work grain-free if that’s your thang. Once mixed, it’s time for the oven. Bake at a low-ish temp for about 30 minutes and you’re in the money – ya know, granola money! We’ve been loving this granola straight up with almond or coconut milk. We also love it atop things like our Mango Coconut Yogurt, Perfect Bowl of Oats, Super Green Spirulina Smoothie and Tahini Chocolate Soft Serve! 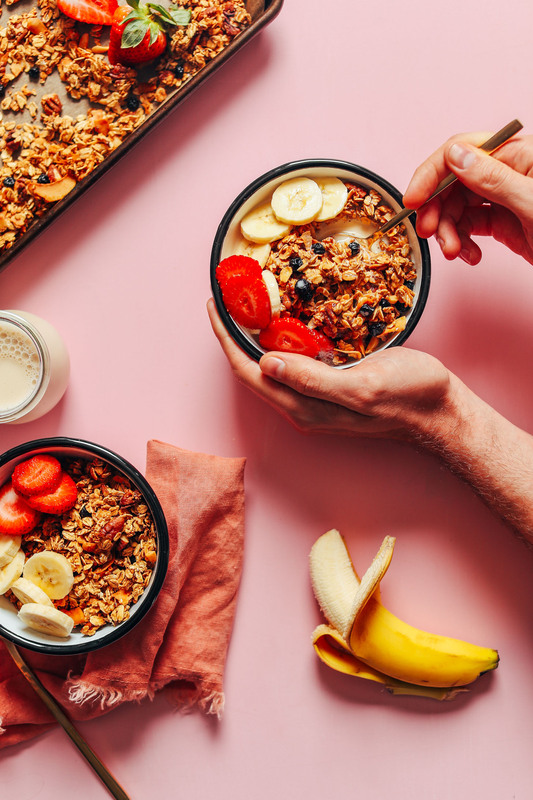 If granola is your thing, be sure to check out a few of our other favorites: Sea Salt Dark Chocolate Granola, 7-Ingredient Quinoa Granola, and Peanut Butter Chocolate Chip Granola. If you try this recipe, let us know! Leave a comment, rate it, and tag a picture #minimalistbaker on Instagram. Cheers, friends! 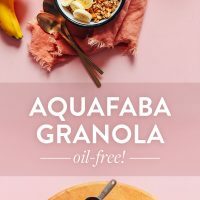 An easy-to-make vegan, gluten-free granola made oil-free thanks to aquafaba! Just 9 ingredients and simple methods required. A delicious, naturally sweetened breakfast or snack! Preheat oven to 325 degrees F (162 C) and line one baking sheet (or more as needed) with parchment paper. 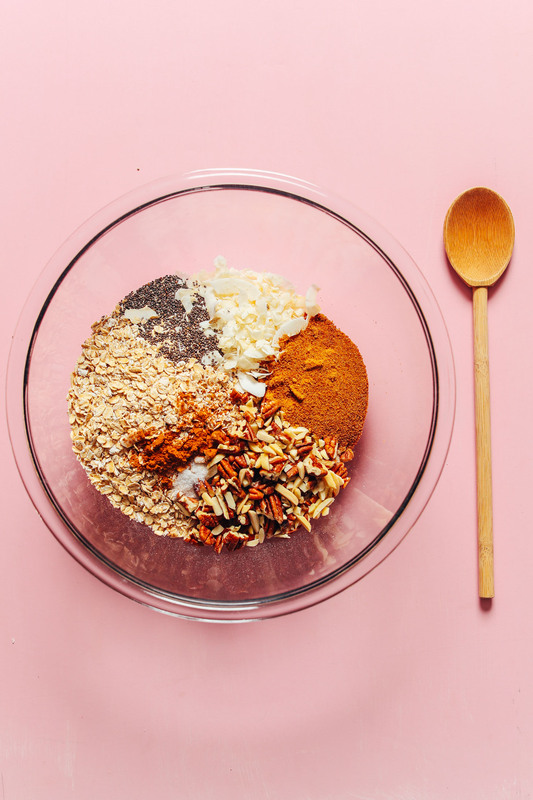 To a large mixing bowl, add the oats, nuts, coconut, chia seeds, coconut sugar, salt, and cinnamon. Stir to combine. Add maple syrup and vanilla (optional) to the aquafaba and beat for 30 seconds more. Pour the aquafaba mixture over the dry ingredients and fold to coat (see photo). Spread the mixture evenly onto a parchment-lined baking sheet(s) and bake for 28-35 minutes (or until fragrant and deep golden brown). Stir a bit near the halfway point and flip the pan around to ensure even baking. Let cool completely. Then add dried fruit (optional) and toss. Place in a container that has an airtight seal and it should keep for 2-3 weeks at room temperature. Store in the freezer up to 3 months (sometimes longer). *To keep this recipe grain-free, sub the rolled oats for a mixture of additional coconut, nuts, and seeds, similar to this recipe. *Nutrition information is a rough estimate based on a 1/4-cup serving size calculated without optional or serving ingredients. So glad to hear it, Jo! Thanks for sharing! My husband loves granola but the recipe he likes has oil. I tried this recipe an he did not even notice there was no oil. Thank you for a great oil free granola. I was very excited to try this recipe, and followed all the instructions to the teeth, only to find a burned granola after 20 minutes of the batch with the recommended temperature. Oh no! It sounds like your oven might be running hot, Margarete.. We’re sorry this happened but if you give this recipe another try, I’d turn the temperature down and watch it closely. This is the most delicious granola that I have ever eaten. The level of sweetness is just perfect and the complexity of the flavors is amazing. Thank you for this great and so simple recipe! Yay! Thanks for sharing, Katharina! Awesome and crunchy. Amazed by how yummy the aquafaba was! So happy to have a lower fat granola recipe. It was a little sweet so I may cut the sugar back next round. I have already recommended this recipe and will definitely make it again. The only drawback is that it is a little addicting. Thanks for the recipe! Ps Teenager approved, as well ! Customized the oats just with cashews and raisins while sticking to the rest of the recipe and BAM! Turned out brilliant. Great crunch and perfectly roasted nuts, awesome! No need to whip the chickpea brine! I used it straight from the can. Super yummy. THANK YOU for another recipe to add into our rotation. I love this recipe. I’m wondering if you have any experience or advice for making chocolate granola? Would just adding cocoa powder work or do I need to take anything else into account? Hi Sarah! We actually have a chocolate granola recipe which you might be interested in! Check it out here! Delicious and clumpy! I left out the coconut sugar and it turned out great (though not as sweet, of course, but that’s what I was going for). If you like clumps, I think you can get away with using a bit more aquafaba than the recipe calls for and *not* stirring it all during cooking and cooling. We normally use your nut and honey granola recipe and it’s amazing but this has been a wonderful alternate as we use a lot of chickpeas and I normally just toss the aquafaba down the drain! I cut the sugar a tad (3tbsp) and add in pumpkin and sunflower seeds and do a mix of almonds/walnuts/pecans for the nuts. I add 1 tbsp of cocoa. I also use honey instead of maple syrup. Smart! Thanks for sharing, Rachelle! Made this twice, it’s very good and easy to make. Glad you found it easy, Megan! Delicious, made it for the first time and had to make adjustments because some ingredients were missing. I was using the pan for the first time (didn’t have parchment paper) so I added a teaspoon of coconut oil just in case. It turned out amazing. I love it, super crunchy, tasty and it passed the test with someone who really dislikes oats in any shape or form. Thanks for all your amazing and inspiring recipes. I love them all! I’m not anti-oil by any stretch but do like the idea of not needing to use it in stuff like granola. 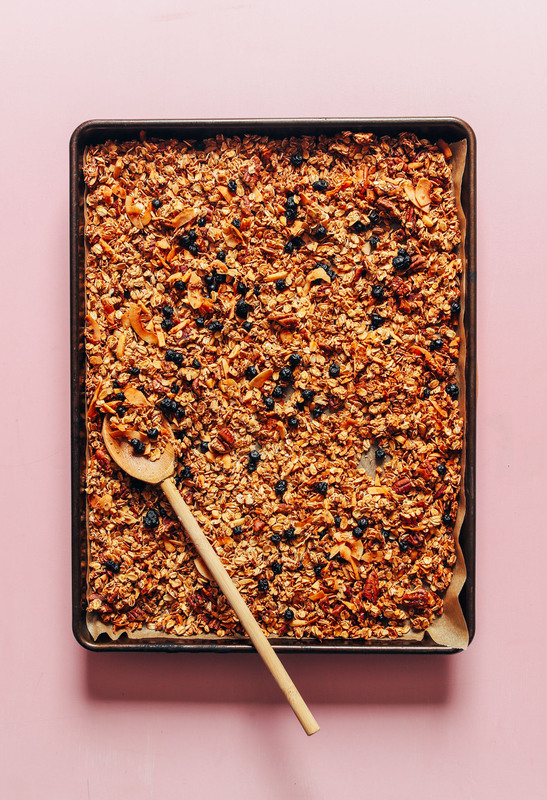 This recipe is the third no-oil granola I’ve tried and it is hands-down the best. Texture is wonderful and flavour is outstanding—almost buttery with zero beaniness. We only had two cups of oats and so I subbed in an extra cup of nuts and seeds, and added a bit of cardamom, but otherwise followed exactly. Yay! Glad you enjoyed it, Gill! This granola is delicious! I don’t like chia seeds so used hemp seeds and doubled or more flaxseed meal. Also cut down the sugar to one Tbsp. Smart! Thanks for sharing your changes, Sally! Hi. 1/4 cup of aguafaba equates to how much unwhipped water, do you know? 1/4 cup aquafaba is 1/4 unwhipped water. Another great recipe, really genius to substitute oil with aquafaba, thanks Dana! I’ve made it a couple times now, and it turns out great every time. A quick time saving tip: I found that the aquafaba whips up so much faster in a blender. After only 2 minutes on normal/medium speed, it has the same consistency as whipping it with an electric mixer for 10 minutes ;) although small amounts do not form as firm peaks as it should, it still works and gives the perfect crunch to the granola. I have a batch in the oven right now, sweetened with date syrup, looking forward to trying that! How did the date syrup work with it? Baking temp and times? Works just the same! I didn’t add as much as 1/4 cup because it doesn’t have to be too sweet for me, but I like the somewhat caramel taste that the date syrups gives. I didn’t change the baking temperature, and I think mine was in the oven for around 30-32 minutes. Hi Mollie! Unfortunately I’ve heard chickpea water works best, and the other beans don’t whip as well and also taste more of the bean. I made this today, and it turned out yummy. I was hungry for granola and didn’t want to buy it at the store where all offerings have added oil. This is so good I don’t miss the oil at all. I’ll definitely make it again. Thank you for posting! Whoop! We’re glad you enjoyed it, Laura! Very nice and crunchy granola, would make it again! I made this recipes a couple of times now and am amazed by how crunchy this granola is! Honestly, who would’ve thought that you could achieve so much crunch without any oil?! I want to try and experiment with the recipe and maybe sweeten it with a date paste – might have to cook it a bit longer but I think it could work :) Thank you so much for the recipe, it is delicious! I don’t have an electric mixer, can I hand mix and get the same effect from the aquafava ? I’m not sure that will work as well, Angie! Dana, thanks for another great recipe for those of us avoiding oil. I was skeptical, but I just took my Pam from the oven…and it’s delicious! So crunchy..and I used 1/2 cup of sliced almonds and 1/2 cup of pumpkin seeds for the nuts. I also had the coconut shards from Trader Joe’s that add a lot of flavor and crunch too. This is a keeper! Glad you enjoyed it, Heidi! This was wonderful! Due to a combo of laziness and lack of ingredients I also made 3 shortcuts that people might want to know about – rather than using chopped nuts/chopping them ahead of time, I just threw some nuts, seeds and oats into the food processor and pulsed. I omitted sugar altogether. Then I skipped whipping the aquafaba; just whisked it with the vanilla and maple syrup and folded it into the dry ingredients. It crisped up just fine…I’m sure it would have been even better if I had followed the instructions, but I don’t plan on finding out due to previously mentioned laziness! Thanks for the oil-free recipes! Thanks for sharing your recipe changes, Rebecca! Love this granola and the lower fat content. 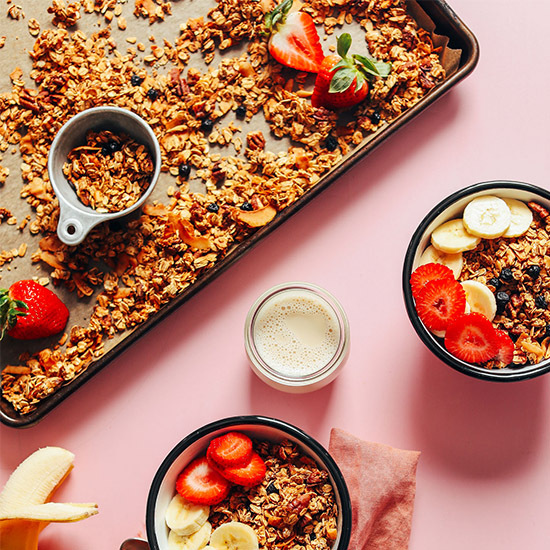 My house smelled like a waffle-cone factory while baking and I feel like I’m indulging whenever I dive in for a fistful of this healthy yummy granola. Yay! Thanks for sharing, Brooke! Best granola recipe ever! I dumped some extra cinnamon in, used a mixture of almonds, pecans, and sunflower seeds for the nuts, about 1 T maple syrup and 1/4 tsp Stevia with vanilla. Smelled amazing and tastes even better. 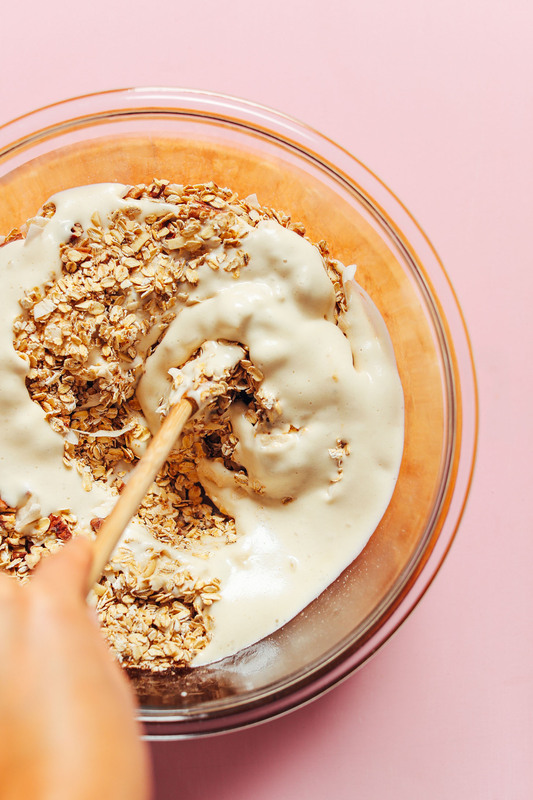 I had just tried and failed a different granola recipe using aquafaba, so I was so excited to see this recipe in my inbox a few days later! Great additions, Julie! We are glad you enjoyed it! I like your information and you ideas are wonderful.Thanku so much. This was my first time making granola and it was easy to make, perfectly crunchy and delicious! Great recipe! WOW. I made this without nuts and used ground flax instead of chia seeds. It’s incredible! Sweet and comforting and really fantastic texture. This is my first time using aquafaba too- I worried about any after taste, but this flavor is fantastic. LOVE IT. So glad you liked it, Sarah! Dana, thank you…this is absolutely genius! Just took this out of the oven…it’s delicious. I used sliced almonds, pepitas and coconut shards for my add ins. I have been looking for a way to enjoy an oil free granola that still had crunch..and this is it! So glad you enjoyed it, Heidi! This turned out great! Crunchy, flavourful, satisfying and fresher tasting than granola made with oil. I skipped the sugar and as I had no maple syrup i substituted it with rose syrup. I also added some grounded flax seeds and freeze dried berries. Will make again! Thank you! Hello – I’m a huge fan of yours but have never left a comment before so I’m being brave. I have your free book and I also bought your Everyday Cooking book from Amazon and, although nothing of mine ever looks like your photos :-) the food always tastes good. So, onto the granola, I made this today and although I had to use loads more aquafaba than the recipe suggested, and forgot the maple syrup, the end result is amazing. Thank you so much for all your hard work in producing really brilliant recipes. Thanks for sharing, Judith! So glad you’re enjoying the recipes. This way the most successful oil free granola I’ve made! I’ve tried pureed fruit, baby food or diluted honey but they were TOO crunchy, too brown, never quite right. This was nicely browned, crisp and just sweet enough. This is it! No more searching? Thank you!!!!! Came our great as far as texture for the granola. Nice and crunchy! A little sweeter than my personal preference, so I will probably omit the coconut sugar next time or just use less than 1/4 cup. I saved the chickpea brine for this recipe while making your AMAZING Sunflower Chickpea Sandwich- it was SO SO good, I made it twice in 3 days, and plan to make it all summer long. So good. Anyway, I had first made this granola using chickpea brine at room temperature and it took the full five minutes to reach a whipped peak consistency. The granola browned too much in my oven using the recommended times, so I am making it again as we speak and will bake shorter. What I wanted to mention is that I had chickpea brine in the fridge and when I made the aquafaba right now, it literally took less than a minute to reach the correct consistency- have you noticed this- that if the chickpea brine is cold, it whips ups much quicker? Anyway, thanks for the great recipes. I have made tons of your recipes- and I must say that Sunflower Chickpea Sandwich is incredible!!!! Yay! Thanks, Michelle! I haven’t noticed much of a difference in whipping aquafaba when at different temperatures but maybe you’re onto something! Thanks for sharing! I love this recipe! I don’t like coconut, so substituted in some various nuts and hemp seeds. It is delicious and will become a staple in my kitchen. Thank you! Lovely, thanks Jayne! Would you consider leaving a rating next time? It really helps us out! We are eating chickpeas all the time, so we always have aquafaba at hand – this stuff is magic (want to try your vegan mayo soon, btw :D)! And instead of simply replacing the empty granola box with the supermarket stuff we usually buy for our daily oatmeal, I just made a batch of this. Cooling down right now, but already smells delicious and I’m guessing it will become a staple around here. Thanks so much! Totally fantastic recipe! I used more nuts and seeds and less oats, and am absolutely jazzed with the results. Crunchy, toasty, absolutely perfect. It is all I can do to keep away from just eating it dry by itself as a snack! I’m totally on board for all things aquafaba and I want to buy a cookbook solely for aquafaba based recipes but I don’t know which one to buy! I really respect your opinion so could your review the aquafaba cookbooks by Rebecca Coleman, Zsu Dever, and Kelsey Kinser? Maybe post a comparison? If this recipe doesn’t secure your position as a goddess, I don’t know what will. I subbed pumpkin seeds for the nuts, which came out amazing. And my house smells so good! Thanks for the recipe Dana ! I made it exactly as posted . It’s really yummy but it didn’t clump at all ! Delicious! And very easy. I love using the aquafaba instead of oil — adding all that oil to granola always felt odd. 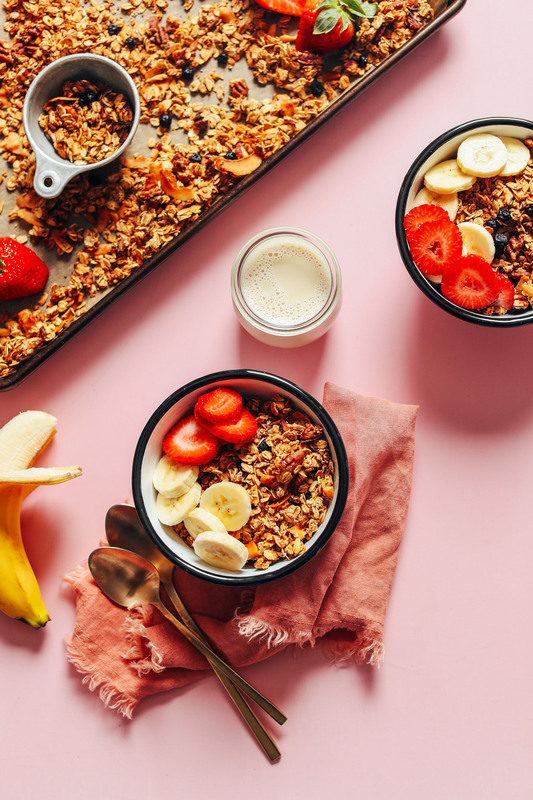 This granola is wonderful with yogurt and fruit — I’ve been enjoying it every morning since I made it a few days ago. Many thanks for this easy, tasty recipe. THis granola is seriously amazing! I was a little dubious of the idea but OH MY it works! I blitzed up walnuts and some mixed seeds instead of chopped nuts and desiccated coconut. This is my new go-to granola recipe, looking forward to experimenting with different flavours too! Thank you! I made this granola and it turned out delicious!! I was curious to see how it would turn out with the aquafaba, and it turned out great! Thanks Dana for this simple and yummy recipe! has anyone tried whipping the bean juice in a Vita-mix instead of with a mixer? We haven’t, but I’d guess it works. Let us know how it goes! Aquafaba FB Group I joined recently says blenders & food processors DO NOT work. Need to use a good stand mixer like Kitchen Aid. I am personally inexperienced, but remember reading this in comments. Eager to get started and will def be making this granola! Thanks for the recipes. Just pulled this out of the oven :) I used agave nectar instead of maple syrup to cut down on the glycemic index a bit more. I’m also planning to use a mixture of dried blueberries and cherries once it cools. Thanks for the great recipe! I’m curious to try the aquafaba recipe but just sayin’ there’s a less complicated recipe. P.S. I love your recipes! I bet using apple juice an honey is delicious! 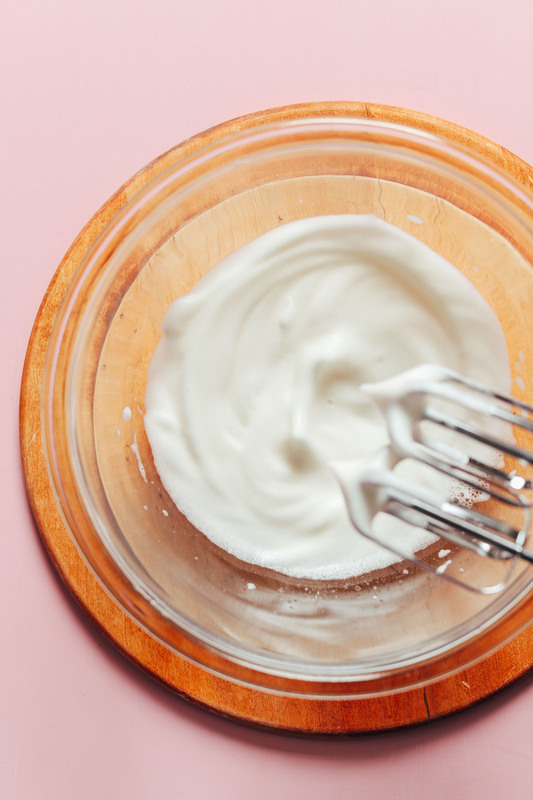 It’s a lot of sugar for some people, though, which is why the Aquafaba is appealing to some. I just made this granola and am pleased to report that it was very successful! Super crunchy! 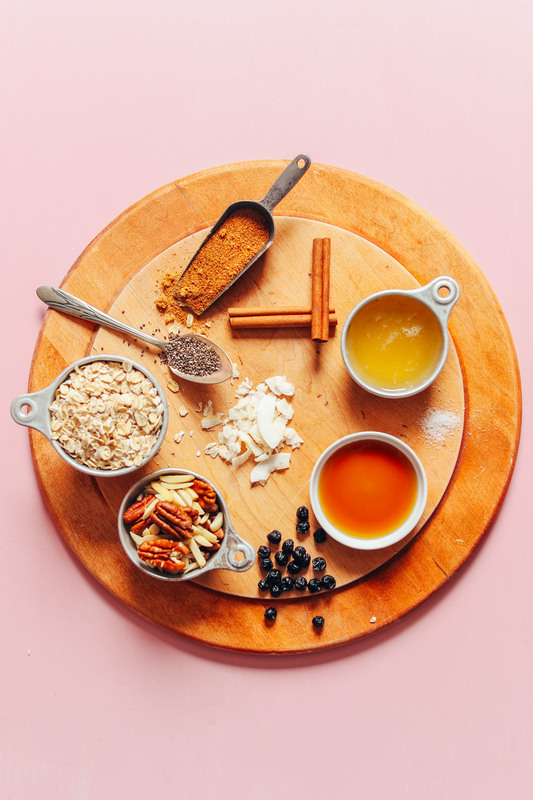 I feel like you read my mind – I have been looking for a health granola recipe for some time and had not found one without oil that still crisped up. I actually cut the salt and dry sugar in half, and it was still delicious, so I have no doubt the recipe as written is even more delicious! I was kinda scared about the aquafaba b/c I have had some aquafaba fails :( but I just sprinkled in a little cream of tartar, and it whipped right up (I used the liquid from Bush’s organic chickpeas). Thanks for the keeper! Thank you for this amazing and creative recipe! I have made oil free granola in the past, but there are way too little recipes showcasing oil free granola! Glad that you used aquafaba too–it goes to show all the possibilities of its uses! This granola looks amazing and I’d want to add cacao powder to make a chocolate granola! Totally would eat the WHOLE batch of granola in one go! Hi hi! I always sprout my chickpeas before cooking them in my instant pot…can I consider the cooking liquid aquafaba? Perhaps, I’ve heard you have to cook it down first before it will work. And it may not whip as well. But let us know if you give it a try! Made this today, and loved it. Thanks so much. I’m thinking of using it as a crisp topping on a hot peach/ blueberry filling. I’m glad that you are embracing the oil-free movement! We try to eat as oil-free as possible so I’m always looking for recipes that are oil-free. I can’t wait to try this! Thanks! We love providing options for everyone – oil and oil-free eaters! Way too excited to try this!!! Trying to reduce fat!! Ps Love your cookbook! Curious to know it the liquid from black beans might work also? Unfortunately I’ve heard chickpea water works best, and the other beans don’t whip as well and also taste more of the bean. This was amazing!! I was skeptical it wouldn’t be crunchy, but I was wrong. I didn’t miss the oil at all. My husband loves it too. Loved the fact that I can indulge in granola without worrying about oil content. It’s a different kind of crunch, perhaps that’s what you enjoyed slightly more with the oil version. You could also always scale back on oil by subbing aquafaba but not remove it completely. Hope that helps! How long does Aquafaba last in the fridge? Hi Jerilyn! The rule of thumb is to treat it like egg whites. A few days shouldn’t be a problem in anyone’s fridge, but if you plan on keeping it more than a week or two, you’re probably better off freezing it. In my experience it de-fluffs in the fridge but will easily re-fluff when you mix it again. So don’t panic and throw it away if you go to retrieve it and it’s totally watery again. It will re-fluff! ? Can I use maple syrup instead of coconut sugar? I think so, but we haven’t tried it that way. It may make the granola a bit too wet. Perhaps scale back to 2 Tbsp and go from there. Or, add more oats or coconut to compensate. I only used 2 TBSP of the coconut sugar and it came out great! Yes, but mix it in with the Aquafaba after you whip it so that the sweetness of the syrup distributes itself more evenly. will this help make the granola clumpier as well? If you add slightly less dry ingredients to the wet ingredients, it usually helps the granola clump more. And try not to stir during baking or cooling, which also encourages clumping.